Why we’re driving it: the time is right, and right now, for the Genesis G70. It’s less than a month until the Australian order books open for the landmark South Korean car, created as a head-on challenger to the BMW 3 Series. Genesis is promising a car with the same driving focus as the Three yet loaded with more equipment, a better ownership experience - from a ’studio’ in place of a showroom through to a five-year warranty - and a price that undercuts the German benchmark by about 15 per cent. Around $55,000 is the likely starting point for the G70, equipped with a four-cylinder turbocharged engine that has a lot in common with the power-plant in the rorty little Hyundai i30 N. There is also a 3.3-litre twin-turbo V6 and the G70 will be available with four levels of trim and equipment, taking a fully-loaded car beyond $80,000. Australian Business Traveller snared an exclusive preview drive of the G70 in the USA to see – and feel – how the car is likely to go in a class that orbits around the Three, but also includes the Mercedes C-Class, Audi A4, Alfa Giulia, Lexus IS, Infiniti Q50 and XE Jaguar. On the outside: There's nothing particularly adventurous about the design of the G70. It’s stylish enough to sit comfortably in the premium class, with a tautly-drawn four-door body that hints at a car that’s more than just a boulevardier. There are sharp crease lines down the sides, a prominent chromed grille, big air intakes in the nose, and just enough on the spoiler front in the nose and boot to give it a sporty kick. The alloys fill the guards and some models sport red-painted brake calipers. For background, the G70 is a distant relative to the Kia Stinger which has won a lot of friends in Australia. Their basic chassis is the same, the V6 engine and eight-speed auto are shared, and joint development cut costs. 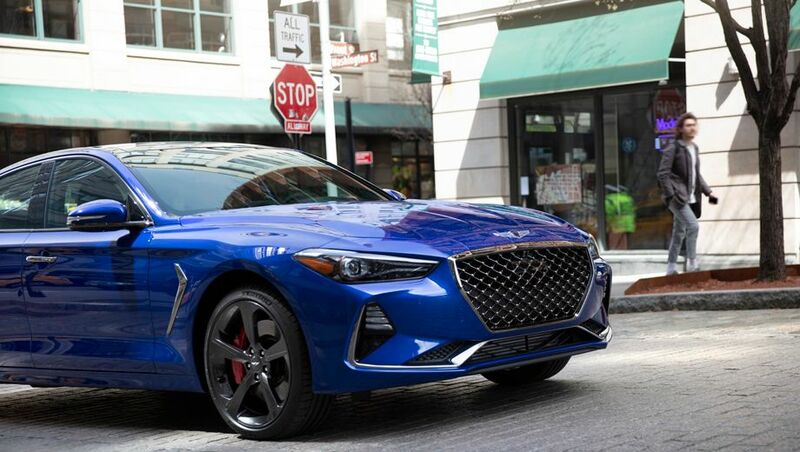 But, and it’s a big but, the G70 is shorter and is pitched as a sports sedan, where the Stinger is a five-door hatch and a grand touring cruiser. Genesis boss Manfred Fitzgerald says there is not a single Hyundai or Kia stamping, or label or badge anywhere on the G70 and I believe him. I looked, hard, and could not find a single thing that is not Genesis. Under the bonnet: The V6 engine is the bait for buyers who are prepared to take a chance on a new car and a new brand, but there is also the four-cylinder turbo as a price leader and for more fun. The G70 is old school in its layout, with the engines in the front and driving the rear wheels, because it’s a proven package for a sporty sedan. There are paddles behind the steering wheel for the automatic, as well as a predictable choice of driving modes. All-wheel disc brakes are a given, also fully-independent suspension, but there's a twist. Australian engineers have been involved from the start of the G70 program down under, tuning the suspension for local roads and also devoting lots of effort to maximising comfort and keeping the car quiet. On the inside: First impressions count for a lot in the prestige car world. The interior is not as Scandinavian modern as an XC Volvo, or as stylish as an Audi A4, but it has everything you need, the materials are good and the finishing is flawless. The display screens are big and clear, the controls and switches all have a premium looks and feel, and the approach is a drive-focussed layout. Space is ample for the class, although best only for four adults, and the boot is roomy enough for the usuals including two sets of golf clubs. On the road: The big surprise comes as I roll the G70 onto the road. In this case it’s the rolling hill country of Northern California, with a pair of G70s to sample both the V6 and the four-cylinder turbo - with a six-speed manual gearbox that’s still only a ‘maybe’ for Australia. The first Genesis in Australia, the G80 sold as a Hyundai, was rather staid and stodgy. In sharp contrast, the G70 is eager and sharply responsive. The V6 surges away from the lights with minimal noise or fuss, while the turbo four is more feisty and keen to get on with the job. Both cars are relaxed at highway cruising speed, very comfortable and with everything I expect from the class in aircon, seats and sound. But when I turn onto a minor road, tackling long uphill curves and some challenging downhill swoops, the cars come alive. They are genuinely fun to drive, responsive and eager, and with none of the floaty feel I remember from the G80 or many other American cars I have driven. In summary: The G70 has every chance of success in Australia. It drives nice and tight, is well equipped and certain to be well priced. The only remaining question is how Genesis will be accepted by buyers who are already spoiled for choice and might take some convincing about moving to a new and untried luxury brand. As a current owner of a Hyundai all i can say is these are great cars and super well built these days. A lot of it also comes down to the post purchase customer service you get in terms of affordable servicing, free roadside assistance with NRMA and a the amount of features loaded into such an affordable car. I really hope Genesis does well here as the G70 looks mighty appealing....to me anyway and it will be interesting to see what other models they roll out in the future. Resale value is always the big question pondering the jump into a new model. As a former BNW/Audi owner, a guaranteed future value would certainly make me consider it. Amazing looking product. Well done Hyundai. Comment on "Test drive: Genesis G70 leaps into the crowded luxury lane"